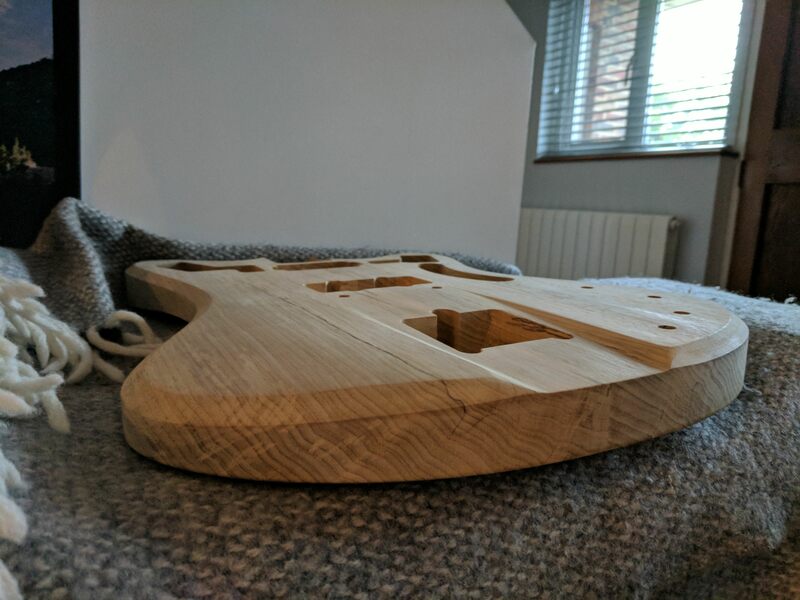 Lately I've been sorting out all my jigging and fixings for the CNC to start making necks as well as bodies, and naturally that has opened up the avenue of constructing set neck guitars! 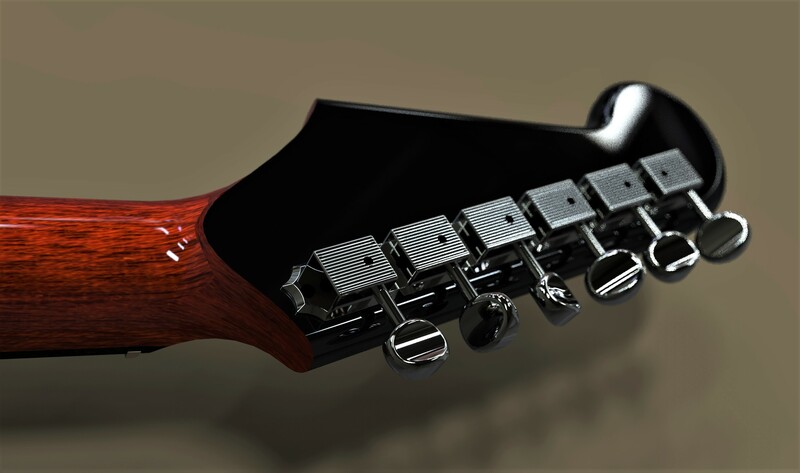 You might have seen one or two renders from when I first designed the shape, but this is the final design for the first run of guitars (bar a few features like the bridge - I have developed one like the Toughset bridge from the other post). Most of the change has occurred around the neck pocket to make way for the set neck construction. I'd love to hear your thoughts, positive and negative, on the design. And if you have any questions I would be more than happy to answer them. There's obviously a lot going on internally with the truss rod design and electronics that these pictures don't show. Here's a render in Pelham Blue Sparkle. 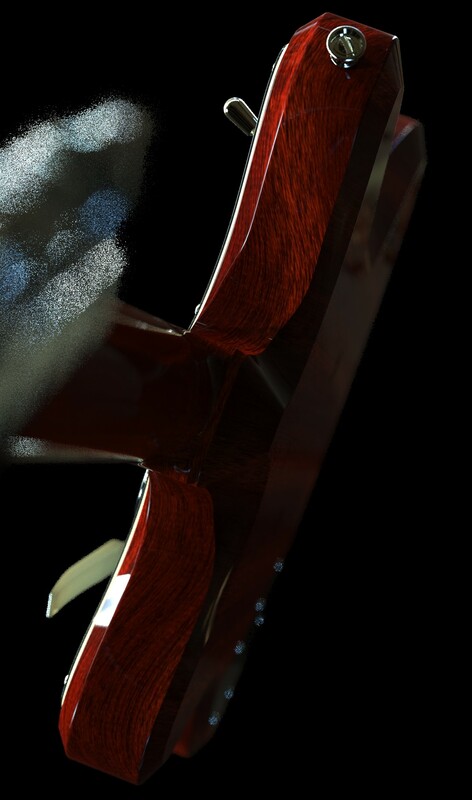 This image is pretty useful because it shows how the arm contour is integrated into the top surface on the front (with a consistent thickness chamfered edge) and this render also has the best lighting to show the Rickenbacker-style 'ramp' that helps get a little more angle out of the Maestro. These images show how the tummy contour (unlike the arm contour) is integrated into the chamfer, not into the back surface of the body. 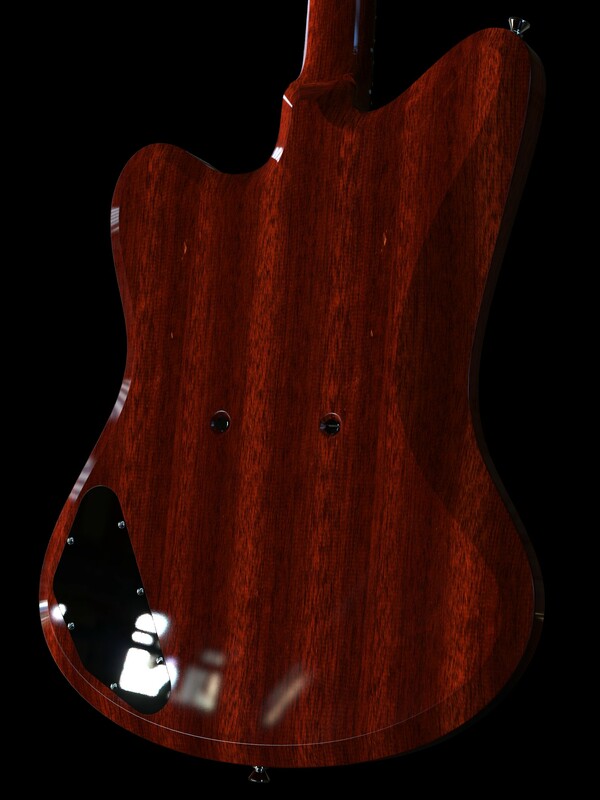 So the back surface perimeter has a kind of Rickenbacker 4000-series look around the bass-side lower bout and waist. I love this Heather Mist Poly / BMM colour, I actually am a big fan of the way Gibson approached their custom colour guitars with the white guards, black pickup covers, matching neck finishes and black headstocks. I think this will be the standard scheme for custom colours, with an optional "F-style" scheme with natural neck, cream covers and body-matching headstock. My partner in crime for this whole deal will be our very own Rexter! So the guitars will definitely be in safe hands, finish-wise. Jon is an absolute dude, we were only discussing the other day how he might go about masking off the split side dots on a body-coloured neck or whether it might be better to do a kind of 'side blocks' inlay instead so we can get a good crisp mask line. He seriously knows his stuff and is just great to work with! The headstock is my own Fender-ish design that is similar in principle but not really in proportion. 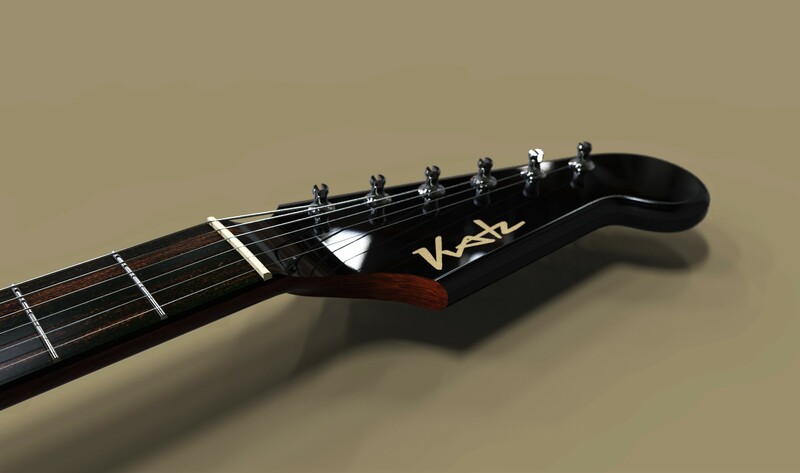 My design is longer, has a totally straight edge under the logo script and the 'ball end' of the headstock on my design is more droopy (inspired by a Fender Electric XII). 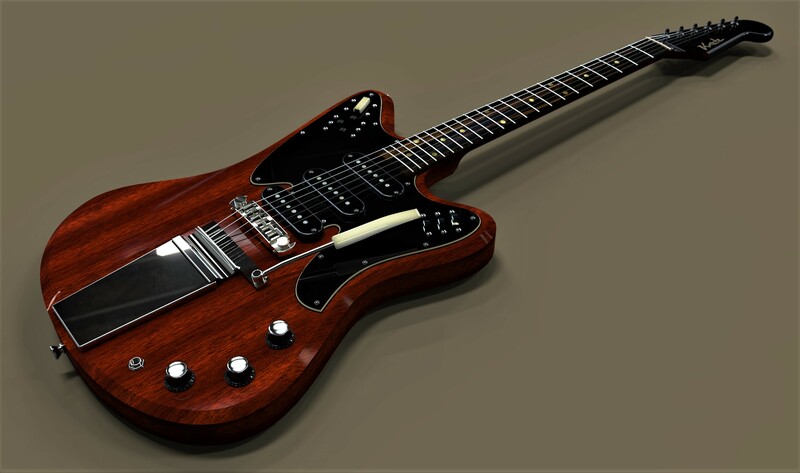 It's subtle, and maybe still a bit too Fender-ish, I'd like to hear your thoughts on that. 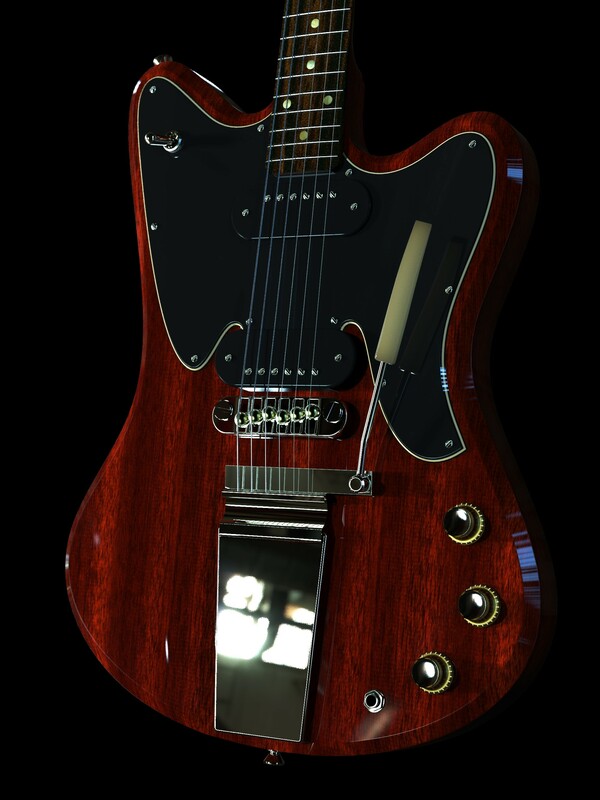 This body actually looks pretty good with a Starcaster-style headstock but there are already a few builders using that. The plan is for Jon to round-over the headstock edges as shown above, so the black or body-matching headstock finish wraps around to form a kind of Gibson-style 'stinger' on the back of the neck. I'm using a thinner 14mm headstock thickness (closer to pre-CBS Fender) in the hope I can use staggered Gotoh Kluson tuners (not shown) and get enough angle out of the top E and B strings to avoid having to use a string tree. This will be challenging given the length of the headstock. 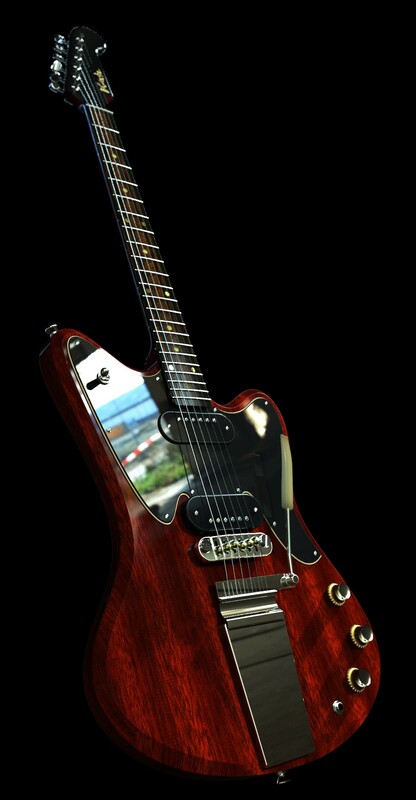 The neck design overall is a combination of Gibson and Fender. I'm using a Gibson-style truss rod setup (single rod in a curved channel, with the 'skunk stripe' invisibly sandwiched between the shaft and fretboard) and a set neck that allows continuity between the body perimeter and the edges of the neck. However, the truss rod will be adjusted from the heel like a vintage Fender, and the headstock is not angled. The neck is a 24-3/4" scale. It will happily accommodate a range of different scale options though and I have developed a parametric model so I can easily key-in exact specifications as concerns neck profiles, taper, nut width and scale. You can see from the above that I've made a compromise between the Gibson and Fender style neck heel designs. 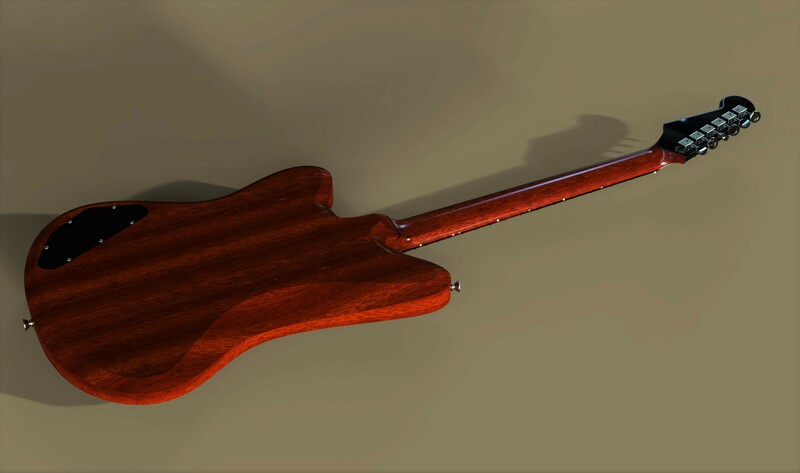 The body is full Fender thickness, partly because I like the chunky feel and partly to allow for enough depth to mount a Jazzmaster-style vibrato if necessary. 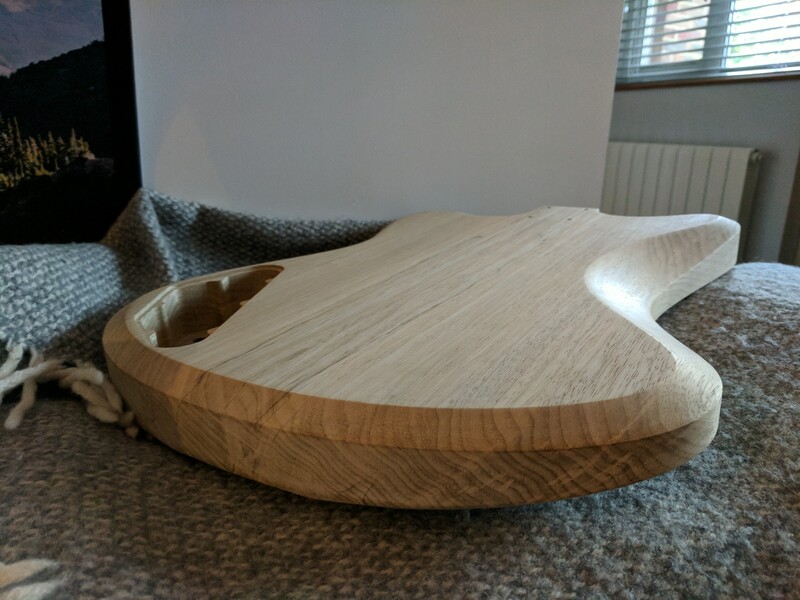 However, just keeping the big 'hump' behind the neck heel will just never look right for a set neck in my opinion, or provide access the same as a solidbody Gibson style joint, especially since I'm using Fender thickness neck blanks (22mm finished thickness) as opposed to the much deeper Gibson neck thickness which leaves less of a 'hump' (visually, at least) and is usually mated to much thinner body blanks on solid body Gibsons (Les Pauls aside!). So my compromise has been to expand the chamfer around the back of the body in that location (like the tummy cut) to offer some more access and remove most of that problematic 'hump'. I'm left with what I think is a nice Gibson-style 'shelf' where the neck meets the body on the back of the guitar. Here you can see the split side dots that might present a problem for finishing! The jury is out on those for the moment. This SG colour scheme is what I had in mind when I started designing the guitar, and that's where the SG-like characteristics came from (pickguard shape around the treble-side waist, edge chamfer, wraparound and Maestro Vibrola combo). 1) instead of the height adjustment being part of the bridge post design, the posts are a set length. Instead, you basically drive a massive M10 cup-tip set screw into the back of the body to act as the bridge thimbles. Height adjustment is set from the underside by screwing these further into the body or backing them out. 2) the bridge posts are slightly further towards the neck so the saddles 'hang over' the back of them. This is because the string angle behind the bridge exceeds the string angle going into the bridge. The natural fulcrum point should be on the line that splits the difference between these two angles. 3) it just looks a bit fatter and beefier, more like a wraparound bridge in size, to evoke the old Firebird III and SG Specials that had the wrap and the Maestro (terrible though that design decision was without locking posts). The pickups for the complex 3-pickup spec in the pictures are being custom wound by Marc at Mojo Pickups and will be a middle-way between a Jazzmaster and a Strat coil. I'm having the bobbins and covers 3D-printed. I also plan to design an identically sized cover for mini-humbuckers (they will fit in the same form factor as the single coils). The overall body design will happily accommodate several different pickup combinations including P-90s and PAFs for more of a Gibson sound. I'll make sure I plan and spec the first 6-12 guitars very carefully to show off all the different options. Here's the first Juniorbird body I took off the machine about a year ago! It's much easier to see the shape in a photograph than a render! Looks killer! I can’t help but wonder what these would look like with block inlays that match the tremolo arm on the blue guitar. Super lust worthy for sure. Stellar work Dan! I love how all those switches and knobs are far away from a rouge strum! Some renders of the simpler 2-pickup model with the new bridge (which has actually already been redesigned, haha! But this looks more like it than the wraparound from the previous images). I've made sure to get a few more angles that show the neck joint so you can get an idea of the access and the look and feel. You'll notice the bridge 'thimbles' are also on this model, driven into the back of the body. Thanks to everyone for all the kind words! Deathjag, yes that's true, it's actually a really big body so there's plenty of space to get controls out of the way or to experiment with lots of different control configurations. It's over 14" wide and won't fit in any 'universal' case I can find, so I'll have to make my own! I think the Tele Bass style pickguard has a slimming effect on the body. i LOVE the look of this thing! 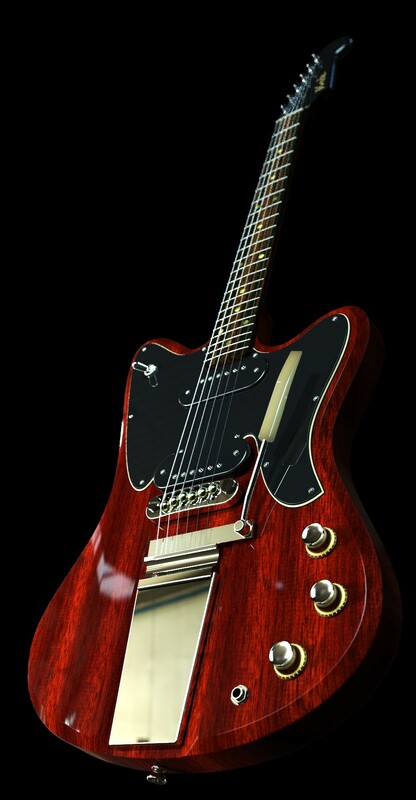 the oval-shaped humbuckers too! What does that double switch thing on the upper horn of the 3 pickup version do? Looks like a little throttle from a spaceship or something. My mind 's got it set that you have some sort of fuzz circuit in there..fire the thrusters! That is a ganged switch, that basically turns two 4PDT switches into an 8PDT, if I recall. It's been a while since I've looked over my wiring plans! Basically it switches between two banks. One bank is the three 2-way switches on the treble horn. They're simple on/off for each pickup and combinations of pickups are in parallel like a normal guitar. The other bank is the three 3-way switches on the bass horn. That's for Phase A/ off /Phase B so you can put them out of phase. Everything you select on this bank is in series, not in parallel. So you are basically adding up (or subtracting if the phase is different) the pickups you select instead of averaging them out. Lets you get basically all the noises you could dream of out of 3 pickups, except out of phase / in parallel, which is the weak nasal sound you get on a Mustang. These are mint! Love the blue. There's a whole lot I like about this design. The overall shape. The chamfered edges instead of a roundover. The way you handled the comfort contours regarding the chamfered edge. The oval pickup shape. The '51 P-Bass type curves at the bridge pickup. The bridge design. The headstock shape is so refreshing in it's familarity and originality at the same time. This is a pleasing design to look at. Well done.